BIGGEST TAKEAWAY: Research driven design choices are a must when it comes to accessibility. Schlotzsky’s provided the Fast Track Couples & Generational Soup Personas among others. We limited down to these personas as they were the people who were ordering online in addition to going in-store. Having known that we were redesigning a site to more accessible, we generated target audience personas to begin the project. The information was gathered from Schlotzsky’s persona information and paired with the Web Content Accessibility Guidelines (WCAG). 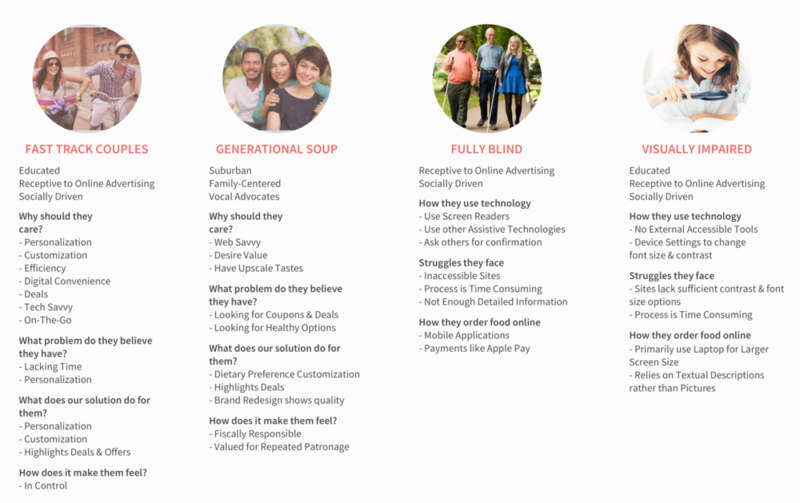 We walked through each persona with a value proposition template to best understand what each person would prioritize in their online ordering experience. This start also helped to recruit for our interviews. Additionally, Rex and I went in-store to evaluate the branding of Schlotszky’s and how they were treating their customers, and discovered their food was also tasty in the process. The team and I working through the affinity mapping. Since we had background information on sighted users from Focus Brands, the team focused on visually-impaired users. 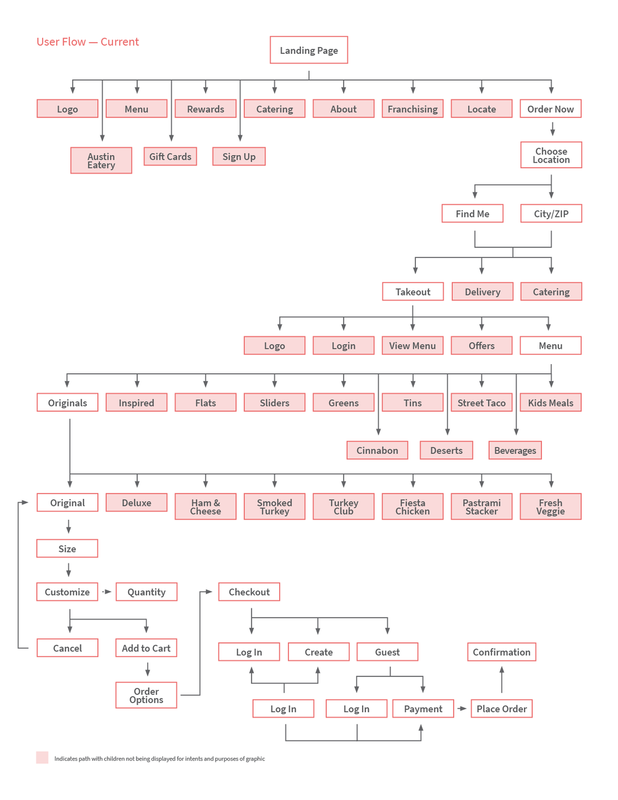 We interviewed two individuals in-depth about their online ordering experiences and gathered the information in the form of affinity mapping. One individual has color-blind vision, specifically red-green impairments; the other individual has no sighted vision at all. 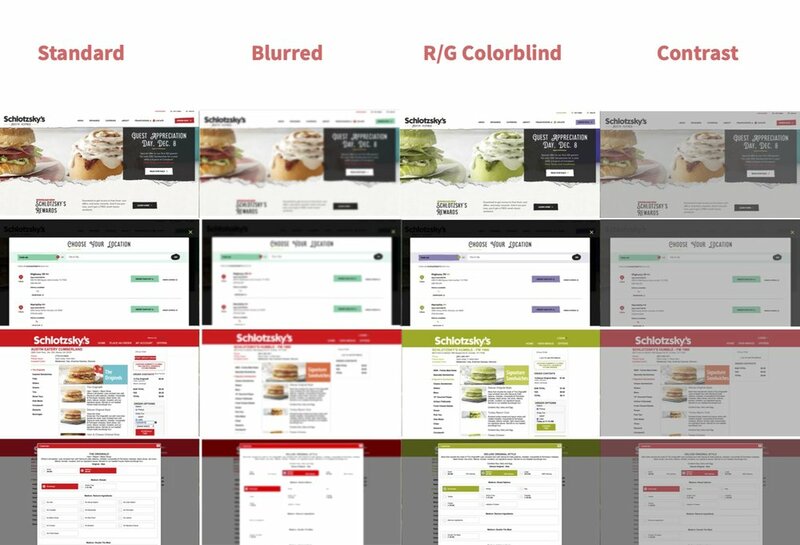 From the affinity mapping, we determined the main processes about which visually impaired users use to order food online, what technology is involved in that process, and also the struggles they endure throughout the process. A summary of our findings from the affinity mapping. At this point, we wanted to breakdown the current experience for all users. We utilized 4 different methods to best analyze this: Tab-Through Analysis, Accessibility Filtering, Journey Maps, and Implications. What better way to understand how a person who is color blind or has contrast issues than to adjust your own screen to reflect that? The team was able to get a taste of another person’s life through a Chrome plug-in, Funkify. With it, we were able to understand the online ordering process, and generally the online experience through different impairments. At this point, we understood our audience better than ever: we had interview data, Focus Brands data, tabbing data, and visually impaired simulation data. Now we moved through their individual journeys, marking areas of opportunity. To start we generated the user flow. 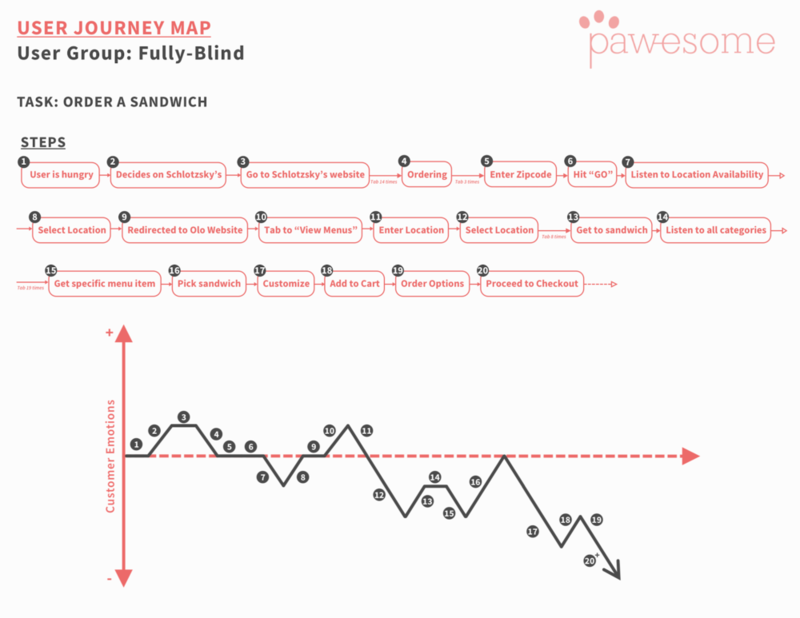 This would keep the journeys as consistent as possible, though we discovered some unique differences between sighted and especially fully blind journeys. Such one was how the fully blind were likely to restart their journey if they were to activate the deceiving “View Menu” option on the e-commerce site; this would actually resend them through the location-finding process, which they would have already completed at this point. Opportunities were determined as periods of prolonged plateaus (positive or negative) and extreme dips into the negative. Here we summarized our design implications and defined what our goals would be during the redesign. These are not only for visually impaired users, but for all users to enjoy. Each teammate went home and drew up different concepts, sections of the experience for the most part. Then we brought all of the sketches together, stitching them into 3 different, distinct directions: accessibility, consistency, customizability. The key features of this concept were limiting the number of tabs required to progress through the site and making the entire sight more easily navigable. 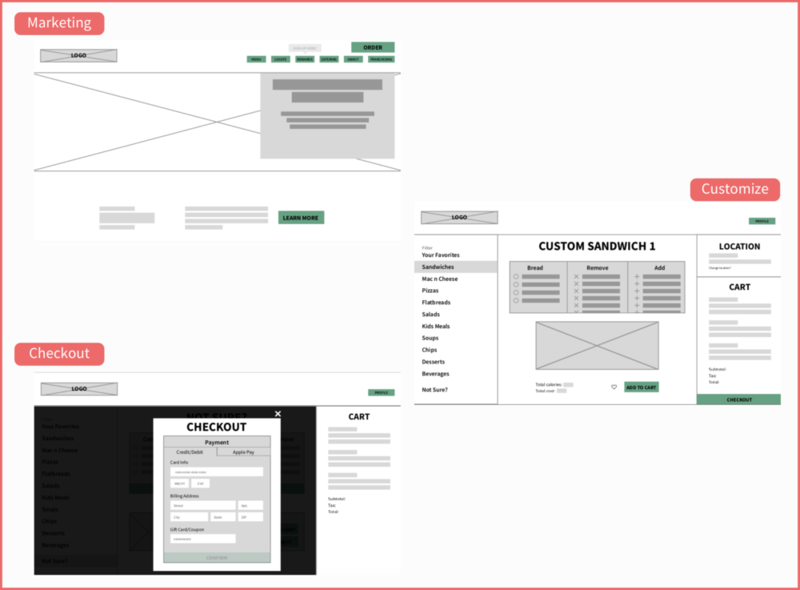 This concept focused on bridging the market site with the e-commerce site (hosted by Olo) with similar interactions and layouts. Taking the best and leaving the worst, we combined all through design routes into a final design. 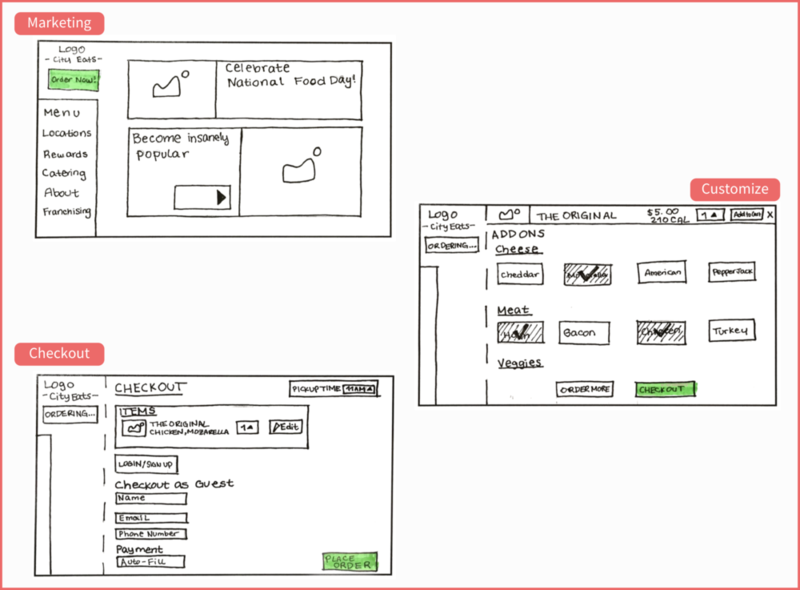 We changed the user flow and made sure to carry out our key features. 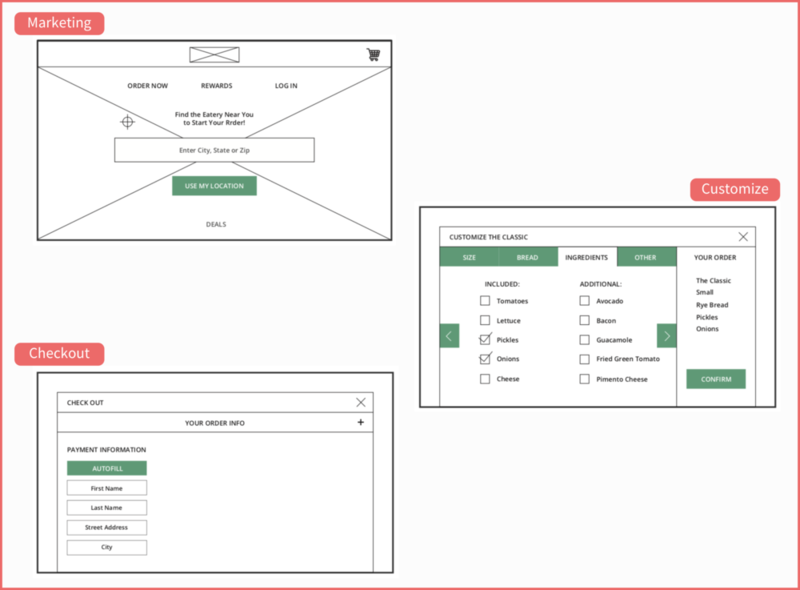 For more in-depth testing of our final design, we preformed A/B testing with the current design versus ours and we also performed heuristic analyses.